For a different way to celebrate a birthday or other occasion, try an ice cream tasting party following the general rules and traditions associated with wine tasting. Select your testing sample from premium ice creams and other frozen desserts made by national and regional companies, and fresh-packed ices, ice creams and yogurts from ice cream shops. We tasted premium products of three companies -- Ben & Jerry's, Edy's and Häagen-Dazs. When you can add new product lines to your tasting experience. One new line of sorbet's is Natural Choice "certified organic" sorbet's. John Harrison Each taster received a rating sheet and spoons. "Silver spoons are preferable to wood and plastic spoons that have a resin and leave an aftertaste," says John Harrison, Edy's Grand Ice Cream official taster. A fourth-generation ice cream taster who uses a gold spoon, he spends four or five hours a day tasting about 60 different batches a day, taking four or five seconds for each taste. Three rounds of samplings of similar products took my family about an hour. We tasted three vanilla ice creams, three chocolate ice creams, and one raspberry sherbet/sorbets. "Vanilla is still the favorite flavor in the United States, and makes up 80 percent of all ice cream sold. Chocolate, in second place, hold 10 percent of the market, with Rocky Road the favorite chocolate flavor. In third place is butter pecan. Strawberry used to be third but now is fourth. Fifth place is held by Neapolitan (chocolate, strawberry, and vanilla) ice cream." For each round, I placed the tasting samples in the same order on fresh sampler plates. Harrison tastes the most complicated combinations of flavors last, but we modified his approach, moving from vanilla to chocolate to raspberry sherbet/sorbet. As with wine tasting, we followed each tasting with a group discussion and cleansed our pallets with salt-free Melba Toast. When we finished the three official tasting rounds, we each built an individual banana split or sundae with our own favorite selections from the products we had just tasted. Harrison says "the 9,000 taste buds of a participant's palate should be clean before tasting begins, and free from the lingering effects of alcohol, spicy food, and tobacco." Taste buds detect basic taste -- bitter, salt, sour/acid, and sweet -- but taste is only one of the five key senses we use to judge ice cream. The others are smell, sight, temperature, and texture. Rinse your mouth with lukewarm water or eat an unsalted cracker. We used Old London Unsalted Melba Toast. For maximum flavor release, temper the ice cream to 5° to 8° F. If the ice cream is frozen solid, remove it from refrigerator five to 10 minutes before the tasting. Taste flavors in order of intensity of taste, as you would taste from white to red wines. Go from vanilla to chocolate to mixed flavors. Use two spoons, one for scooping, the other for tasting. Observe appearance before tasting. Does the ice cream look appetizing? "Look for the ice cream bouquet or top note of the ice cream initially with your eyes," Harrison says. "Appearance is more important than the ice cream's creamy taste or smoothness." Select a small sample off the ice cream's surface and invert the spoon to your tongue. Cover your tongue with ice cream, roll it around your mouth, and smack your lips. Observe the top note of the ice cream aroma by bringing the aroma up through your nose. 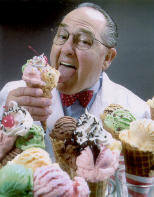 Assess the body and chew of the ice cream. These terms refer to its firmness and resistance or consistency. "Body and texture characteristics are closely associated and are important in influencing consumer acceptance," Harrison says. Factors to consider are the size, shape, and distribution of ice cream crystals and air cells, and the amount and distribution of unfrozen materials. "A 'short chew' has crumbly/brittle body and quick flavor release," Harrison says. "The ideal body or medium chew has a quick flavor release. Heavy chew typically has a soggy body and poor flavor release." As with wine, one need not swallow ice cream to taste it (but we did). Rosalie E. Leposky is managing partner of Ampersand Communications, a news-features syndicate based in Miami, Florida.